The fact that your player keeps fighting after he or she dies in Guild Wars 2 is almost as shocking as the fact that the game has no dedicated healer class. ArenaNet's Jon Peters, Eric Flannum, and Isaiah Cartwright explain. Guild Wars 2 isn't going to be your average massively-multiplayer role-playing game. Developer ArenaNet has made that perfectly clear countless times since the follow-up to the original free-to-play MMO was first revealed. Each new feature that comes to light draws it further and further away from standard MMO conventions, and that's got fans of the genre excited. Take death, for instance. When you die in other MMO titles you generally have to either wait for a healer to come resurrect you, or respawn near your corpse with some sort of temporary penalty placed on your stats. Sometimes you even lose experience points. Dying can really kill the fun of a gameplay session. But death is isn't the end in Guild Wars 2. As the game's lead developer Eric Flannum puts it, "We wanted Guild Wars 2 to be a game about taking chances, taking risks, and exciting gameplay. Not a game about not dying." 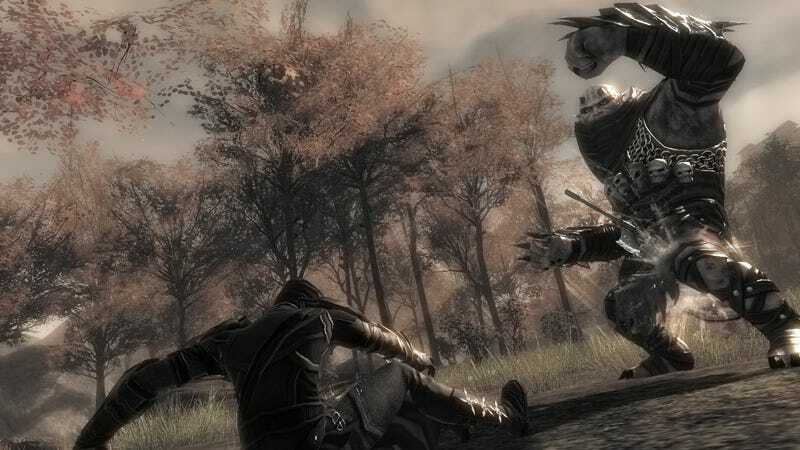 To that effect, the death system in Guild Wars 2 takes a cue from shooters like Modern Warfare. "One of the things we're not shy about is looking at other genres and going 'this is fun in other games, why can't we take it and make it work in the MMO space?" says Flannum. Much like Modern Warfare's Last Stand perk or Borderlands' Second Wind mechanic, when you die, you enter what is called a down state. In your down state, you have four skills you can use to try and take down your attackers, three dictated by your class, and one available to all classes. Should you manage to exact revenge before your consciousness meter runs out, you'll rally, getting back up on your feet and back into the game. If you do die, you can either wait for a player to revive you - all character classes in Guild Wars 2 can revive - or ravel to any previously visited waypoint and revive there for a small fee. The fact that every class can revive demonstrates another key feature of Guild Wars 2. There are no dedicated healing classes. Each character is in charge of his or her own healing. "All the healing that happens in the game - the main meat of healing is your personal heal skill," says Isaiah Cartwright, one of the game's designers. "You are in charge of your health. Other people can help you and support you say by pulling a creature off of you, or provide minor healing, but nothing as effective as you do yourself. " Not only are there no main healers, there are no main tanks, and no DPS. These archetypal roles, commonly accepted as standard in other MMOs, have no place in Guild Wars 2. But how can that possibly work? Don't you need an assigned tank, someone to heal that tank, and someone to do damage? That's not the way Guild Wars 2 is built. Each class will be able to take on different roles. Why? Because it cuts down on two major problems inherit in today's MMO titles. First, you won't need to make sure your party has a good healing class and a good tanking class, and other classes won't have to sit on the sidelines, waiting for a tank or healer to free up for them. Second, it stops parties from getting trashed when the tank or healer goes down. Says Cartwright, ""In those games when your tank goes down and your healer doesn't, you're done for. Any single profession mistake done for. In Guild Wars 2, if your tank goes down, one of your DPA switches and can hold while you get your tank back in the fray. " But what about those folks who enjoy being the healer or the tank? The ones that feel important in their roles? Flannum says they'll just have to share the glory. "We don't want the game to value one profession over the other. We want everyone to feel like they are wanted. Instead of grouping with someone because they are a good healer or a good tank, we want people to group with others because they're a cool player to interact with, cool player…those things matter more." And it makes for cooler gameplay as well. The dynamic nature of death and the healing roles make for amazing storytelling moments, like the one game designer Jon Peters relayed to me during our interview. "Eric and Isaiah were playing just the other day, and they pulled too many creatures. Both went down. Isaiah used a skill called Vengeance to revive himself, and then revived Eric, who used a skill to become temporarily invulnerable. Isaiah's Vengeance wears off, Eric revives him, and they go on to win the fight." Those are the sort of magic moments missing from many of today's MMOs. It could make Guild Wars 2 stand out from the rest of the pack. According to Flannum, these big changes to the genre come from ArenaNet's dedication to their vision. "One of the things we're doing that I think we don't see other companies doing as much, is we're embracing the direction we're taking. You can do it part-ways, or you can just go for it"
Sounds like AreaNet is definitely going for it. Check out the ArenaNet blog for more information on death and healing in Guild Wars 2.